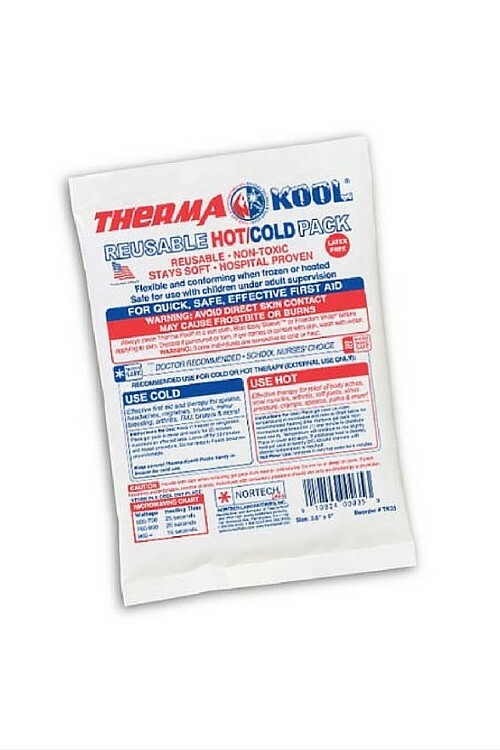 Therma-Kool Reusable Hot/Cold Therapy packs are the preferred choice of school nurses and athletic trainers.Used everyday in clinics,hospitals,and doctor's offices to relieve arthritis and joint pain,muscle strains and stiffness. For cold use store in refrigerator or freezer.For hot use place in microwave for up to 35 seconds (see gel pack for specific instructions). Therma-Kool Reusable Hot/Cold Therapy packs are the preferred choice of school nurses and athletic trainers.Used everyday in clinics,hospitals,and doctor's offices to relieve arthritis and joint pain,muscle strains and stiffness. Therma-Kool is a reusable gel pack designed to provide comfortable pain relief when cold or hot therapy is required.Use cold for the treatment of sprains, strains, headaches, contusions, bruises, minor bleeding/burns. Use hot for temporary relief of muscle stiffness, aches and pains. ThermaKool is the original hot / cold therapy gel. For cold use store in refrigerator or freezer.For hot use place in microwave for up to 35 seconds (see gel pack for specific instructions).